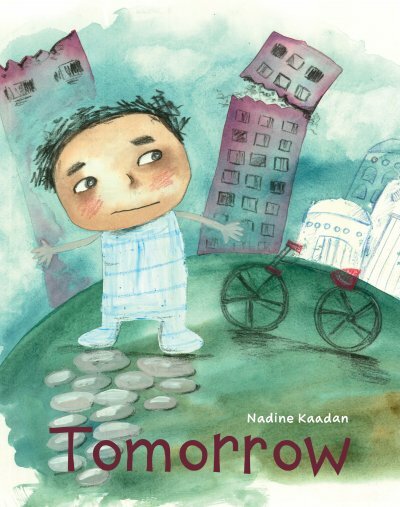 Already a fan of the illustrator and author Nadine Kaadan I was delighted to receive a copy of her new book Tomorrow to review from Lantana Publishing. I have a particular interest in picture books that help children understand others experience of war and about refugees. This story is unique in a number of ways. Instead of focusing on people fleeing their country it focuses on the experience of a boy in his home as it is besieged by war. 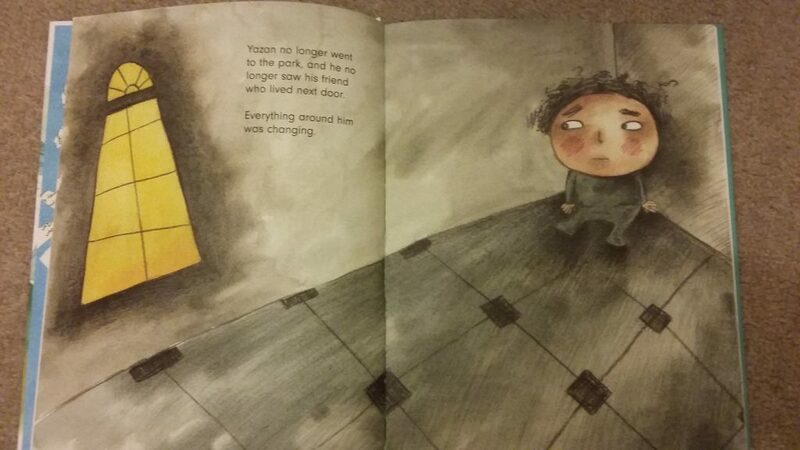 Tomorrow tells the story of a small boy called Yazan who lives in war torn Syria. It is told from a unique perspective as you don’t actually see the war. Instead you get to feel what the immediate effects are for Yazan, as everything changes around him. Changes include no more trips to the park, not being able to see his friends, no school (which he actually begins to miss) and his mother becomes withdrawn. The boys experience is sensitively portrayed and great attention is given to gradually building up all the small things Yazan is not able to do because of the war. The message of the story is beautifully supported by the authors own drawings, which help to convey powerful emotions and to reflect the boys feelings and experiences in a way that is meaningful to children. A simple colour palette of black, yellow and read is very effective. Black for sadness, fear and anxiety, red for happy memories and red and yellow for hope. In some ways the messages in this story are very simple, helping readers of all ages to build empathy with the young boys experience of living through war. Yet the pictures convey some powerful emotions that some children may find upsetting and need help to understand. When using with a group of children I would be tempted to start with the last picture first and ask, what they liked about their local park and how would they feel if they could not go to it. My 7 year old son initially found some of the pages ‘quite dark’. But when we explored the use of red and yellow colours in the story he could also see there was hope in the story too. Whilst not shying away from powerful emotions it protects the reader from the worst of the war in several ways. 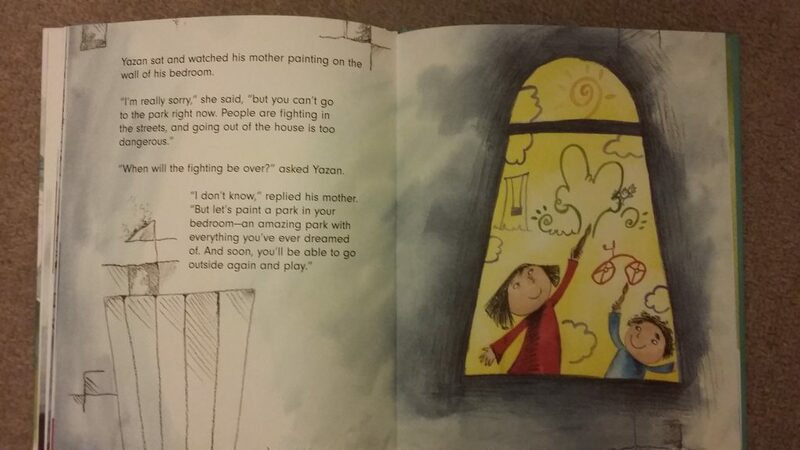 For example: Whilst, his mum does become sad and withdrawn at the beginning, Yazan doesn’t loose either of his parents in the story, they are still together at the end. Another example is you learn about the war outside from a little distance, through a TV Screen, which I thought was really clever. I would highly recommend this for children aged 6+ and young people and adults. It is a great story which encourages empathy and offers multiple opportunities as springboard for discussion. Another of Nadine Kaadan’s wonderful picture books Jasmine Sneeze, would make a great contrast to this story as it is set in a peaceful Syria. You can read my review here. The book can be published direct from the Lantana publishers here.